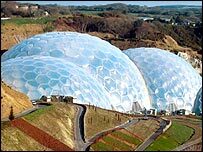 Environmentally-friendly games have been created by Devon students for the Eden Project's website. Digital Art and Technology second-year students at Plymouth University were tasked with tackling the issue of climate change in an educational way. The games show the effect man and the climate has on crop production. Eden's web manager Stephen Bedser set the project. He said the quality of the resulting projects was on a par with professional new media developers. Fifteen teams presented their games and the three best have been selected to appear on the Eden website. Power Lounge, which was created by Chris Mayoh, Ben Reynhart, Jonathan Riley and Sam Milton, were the overall winners. Their game, Crop Master: Protector of the Green Earth, is a series of eco-inspired mini games which include dropping massive corks into polluting chimneys and having to click the mouse fast enough to spin a wind turbine. Other entries included team Eco's Climate Sim, which sees the player taking control of a farmer who has to balance his day-to-day energy and water needs with the growth of his crops and the environmental impact of his actions. AM Visible by Alan Bourne, Mike Lang, Kseniya Volkova, Becky Horsfall and Nic Leek, devised Climate Revolution, an action game whereby the player has to obliterate noxious fumes as they are emitted from power stations and cows while balancing their crops' need for the right amount of water and sunshine. Mr Bedser said: "Besides the technical and design skills, the students were set the tough challenge of tackling big, important issues in a fun way that would keep users interested, and they did this incredibly well."